Are you looking for the finishing touch for your look? 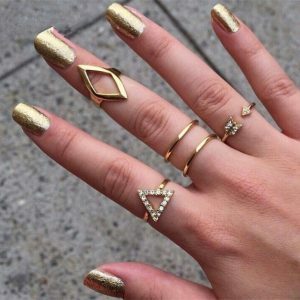 Then decorate your fingers with our rings. The rings from APHRODITE are a real eye catcher! 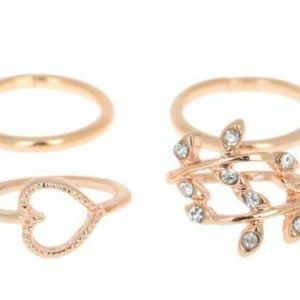 Do you like gold, silver or rose gold rings? We have them all. From striking statement rings with marble, crystals and pearls to minimalist rings that you can wear every day. 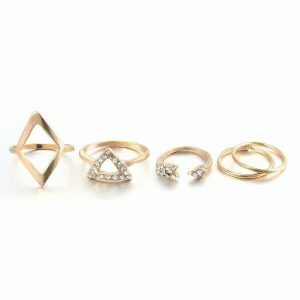 Mix and match statement rings with minimalist rings. 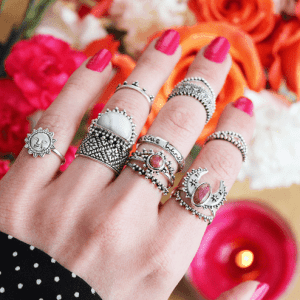 Wear multiple rings on a finger or spread it all over your fingers. Everything is possible. 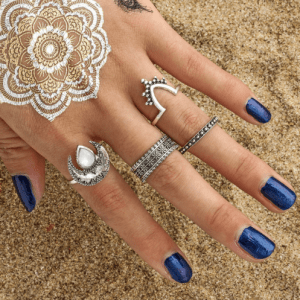 This ring set is perfect to give your boho outfit a finishing touch. It consists of four different rings, in the color silver. 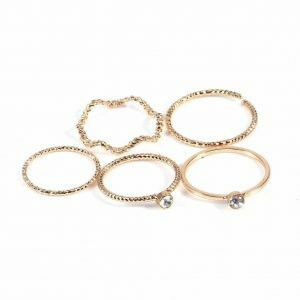 Wear the four rings together on a hand or mix and match it with other fun rings. Finish your look with a boho necklace with an elephant pendant or a cute bracelet. 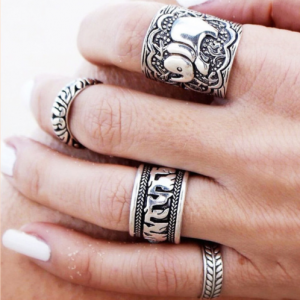 Do you have any questions about the 4 pieces elephant ring set? Send us a message. 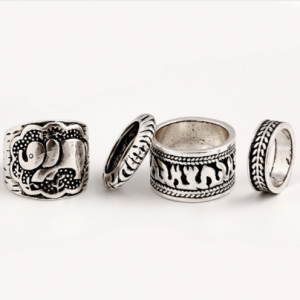 This stunning set of silver rings is the perfect accent to your look. 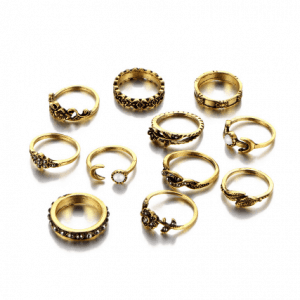 The ring set consists of 5 silver-colored thin rings. 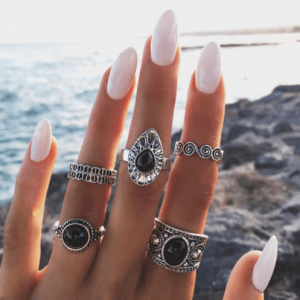 A must-have ring set that is definitely not allowed in your jewelry collection. The subtle, fine design makes it easy to combine with other jewelry and your outfit. Wear the ring set with silver earrings and / or a silver layered necklace. This ring set has a subtle, fine design. 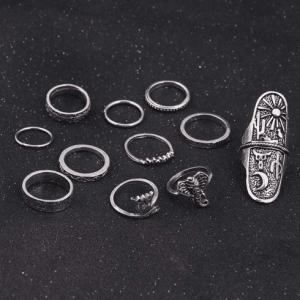 Do you have any questions about the 5 delicate, fine ring set? Send us a message. 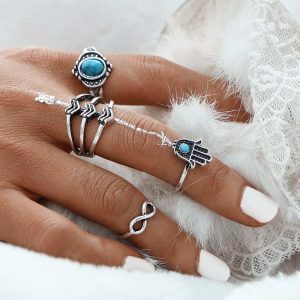 Decorate your fingers with this boho vibe ring set. 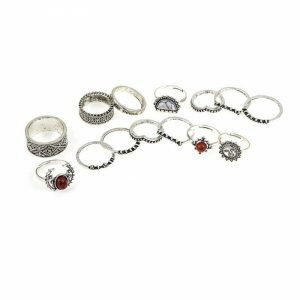 This ring set consists of 6 different rings in the color silver. 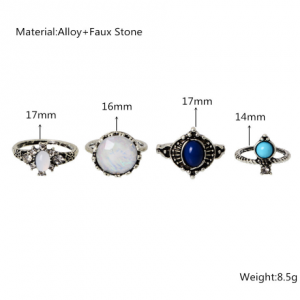 1 large statement ring with blue stone and 5 thin rings. Wear them together or separately. 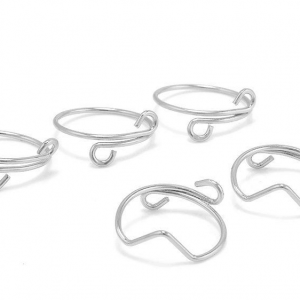 Complete your look with silver bali hoops or a double necklace in the color silver. 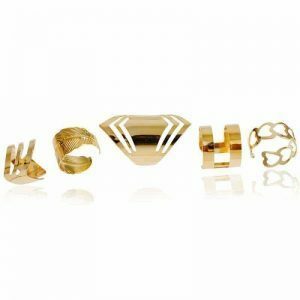 This ring set consists of 6 different rings. 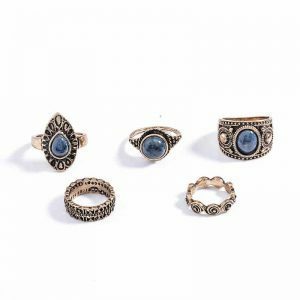 Do you have questions about the silver ring set with large blue stone? Feel free to send us a message. 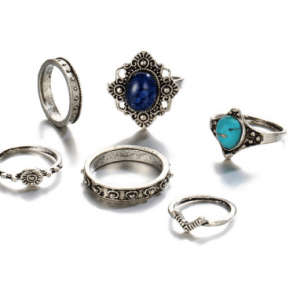 A piece of jewelry that should certainly not be missing in your jewelry box is the ring. At Aphrodite you can choose from many different rings for ladies. You can choose from statement rings and cocktail rings in the color silver, gold or rose gold. The rings we have are with or without a stone. Beautiful rings for a party or evening out. Rings with diamonds and other types of stones with different colored stones such as blue, pink, white, purple, red, turquoise, black, green and even gray. If you don’t know which color you want, you can you still choose the ring with multi colored stones. 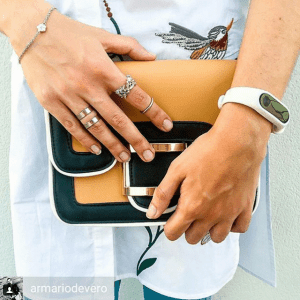 Do you like the ring you wear to stand out? Then you have to go for a big ring. 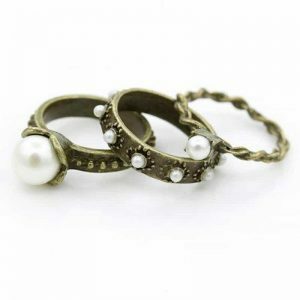 We have also included the ring with pearl or shell in our collection. 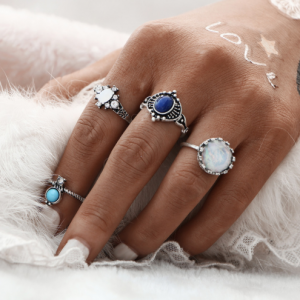 Our playful rings with fun figures such as, a ring with an eye, infinity sign, anchor, button, circle, star, flower and heart ensure that your outfit brightens up. 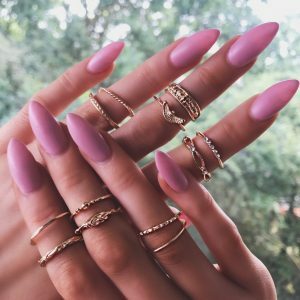 Minimalist rings are super fun and practical! 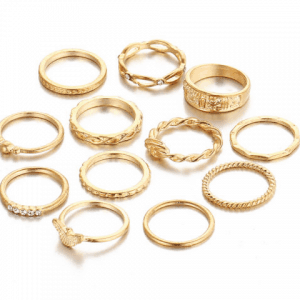 We have a wide range on these simple rings. Go for the color silver, gold or rose gold. 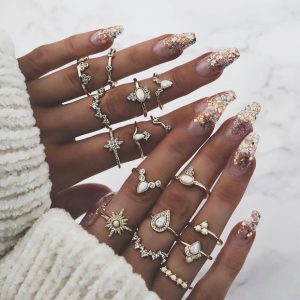 Do you like to wear several rings together? Then choose a minimalist ring set. Are you a real ring fan? Then you are at the right place because we have many different rings. 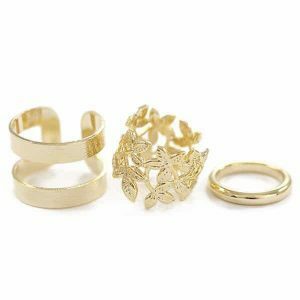 If you like to wear several rings together then you should definitely take a look at our category of ring sets. Wear the rings on one hand or spread it over two hands. Buy a nice ring for your mother, girlfriend, daughter or treat yourself. The small subtle, fine rings are of course super beautiful, but sometimes you just want something extra. 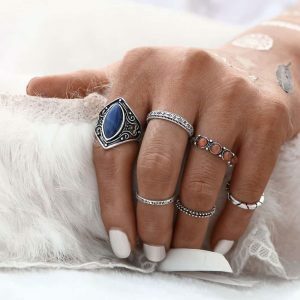 A large statement ring with stone is perfect for that. 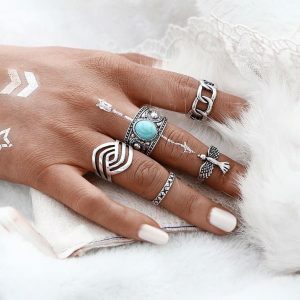 Are you a fan of silver-colored jewelry? then you are lucky! because we also have silver statement rings. 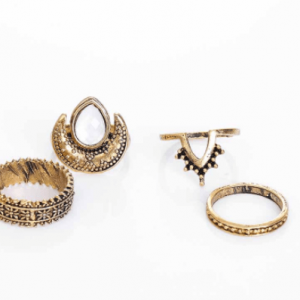 For the ladies who love gold-colored statement jewelry we have gold statement rings. We have statement rings that make a real statement. Do you prefer that there is no stone on it? don’t worry because we also have very nice rings without stone. We can think of the coin ring, which is very nice to wear together with the coin chain. Are you looking for a nice bracelet for your ring? then you should definitely view our bracelets. You will probably find something there that looks nice. We have subtle fine bracelets with nice pendants such as, a heart, asterisk, arrow and anchor. But also other nice bracelets. View our cuff bracelets if you want a nice bracelet for next to your watch. Are you looking for a nice bracelet for your ring? then you should definitely view our stylish bracelets. You will probably find something there that looks nice. We have subtle fine bracelets with nice pendants such as, a heart, star, arrow and anchor. But also other nice bracelets. View our cuff bracelets if you want a nice bracelet for next to your watch. A beautiful necklace and earrings from Aphrodite should certainly not be missing in your jewelry collection. We have a nice necklace and earrings with playful pendants. You can think of a heart, asterisk or arrow. Our double chains are also very popular. For a party or special event we have large striking statement necklaces. The small subtle, fine rings are of course super beautiful, but sometimes you just want something extra. A large statement ring with stone is perfect for that. 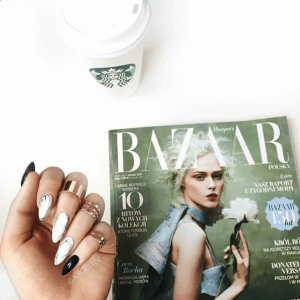 Are you a fan of silver-colored jewelry? then you are lucky! because we also have silver statement rings. 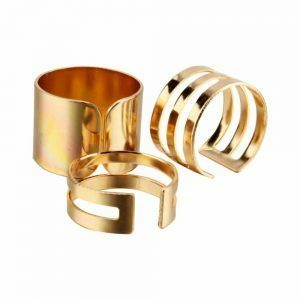 For the ladies who love gold-colored statement jewelry we have gold statement rings. 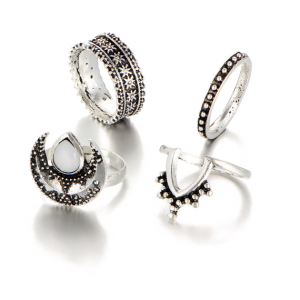 We have statement rings that make a real statement. Do you prefer that there is no stone on it? don’t worry because we also have very nice rings without stone. We can think of the coin ring, which is very nice to wear together with the coin necklace. Are you looking for a nice bracelet for your ring? then you should definitely view our bracelets. You will probably find something there that looks nice. We have subtle fine bracelets with nice pendants. But also other minimalist bracelets. View our cuff bracelets if you want a nice bracelet for next to your watch. A beautiful necklace and earrings from Aphrodite should certainly not be missing in your jewelry collection. We have a nice necklace and earrings with playful pendants. Our double necklaces are also very popular. For a party or special event we have large striking statement necklaces.